Almost a hundred years later, after many productions that used a realistic style of presenting the corrupt, the famous expressionist director Vsevolod Meyerhold “returned to this play its true surrealistic, dreamlike essence,” as Simon Karlinsky pointed out. Since that time, The Government Inspector has been performed not only in Russia, but in many countries around the world, clearly hitting a raw nerve each time. 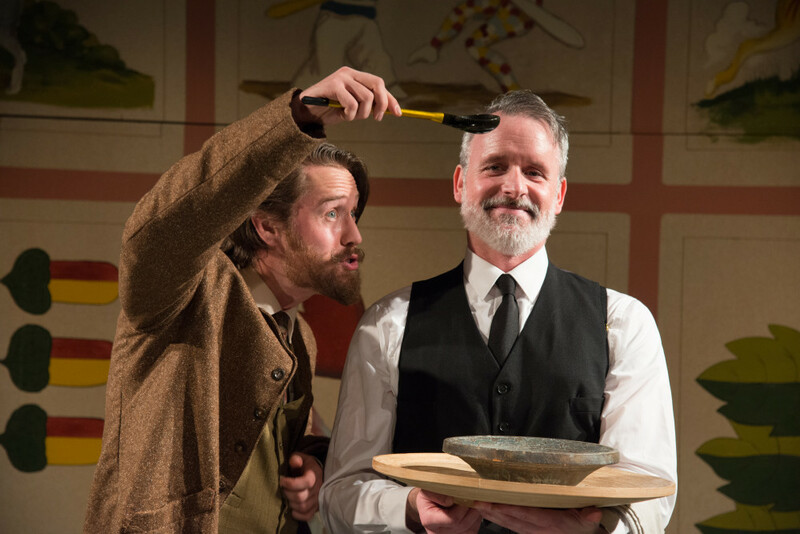 Andrew Carroll and Paul McElwee in IRC’s production of THE GOVERNMENT INSPECTOR. Photo credit: Johanna Austin. Eger: How did you and your actors handle the ruthlessness and corruption of THE GOVERNMENT INSPECTOR’s despicable characters, especially as audiences like to identify with the “good guys,” but are deprived by Gogol to connect with someone like us—or, perhaps, do we identify by becoming aware of the corruption within ourselves? Brock: It’s important to find and play the truth of the characters as a starting point. While it’s easy to accept The Mayor as dastardly, it’s good to remember that people generally make the wrong choices for good reasons, for example, being afraid, or wanting to be protective. It’s helpful to find the underlying reasons for their fear and ruthlessness. However unfounded, they will resonate more clearly if the audience can see the path to destruction. If we paint the characters as caricatures, we are editorializing, which can create static in the storytelling. When people become afraid of deception, loss of protection, and loss of power, unfortunate choices result, and the chain of fear gets passed on like a virus. Eger: This famous comedy of errors—one of the finest satires of human weaknesses—is as relevant today as it was in the 1830s. In your production, are there any references to our own time, however subtle? Brock: No references to Trump, although there is a pop-up devil face in the upper stage left corner that gets plenty of action. The angel is located on the center upstage stage door. The angel absorbs quite a few door slams over the course of the play. Eger: What did you do to trim this five-act play to get it to a running time under two hours? Brock: Cut the heck out of the lines that were repeated more than three times. Eger: The original script by Gogol does not ask for a musical score. Why did you decide to introduce music, and how does it blend in without destroying the satirical aspect of the play? Brock: Much of the sound in Inspector comes from the Grand Budapest Hotel sound track by Alexandre Desplat. I am a big fan of his sound scoring for film and thought this show would be aided by the momentum of a sound score. He has scored many films; his work is brilliant and suited the design of the show. The Grand Budapest Hotel  was a favorite film of mine: the specificity and structure of film director Wes Anderson’s work, his love of the crazy characters inhabiting his absurd worlds. He has a love for outsiders trying to make their way under very difficult circumstances, in a world that, for some of us, seems to be heading in the wrong direction. Eger: You always spend a great deal of time working with your stage designers to enhance all IRC plays, in spite of your shoestring budget. Brock: This is a circus on the stage—a ridiculous affair that we see unfold. The set design for Inspector was built to invoke both the surprise of an advent calendar—what fun will appear today?—and the social commentary of the old Rowan & Martin’s Laugh-In show [1968-73] with guests like Judy Carne and Arte Johnson popping out to deliver the asides of the day. Designers Lisi Stoessel, Maria Shaplin, and Janus Stefanowicz are really fine collaborators. Lisi and I started with discussions about cards, playing cards, showing your hand—which figures in this play in a big way as Khlestakov (the government inspector) tools around from town to town, playing cards, winning money, losing it in the next town, betting all he has on chance, and then bribing the townspeople with his charisma and charm to load up with cash for the next foray. Eger: The article about you as the director of Ionesco’s Exit the King taking on the lead role because the star of the show was ill became one of the most widely read features on Phindie. This year, there can’t be a directorial repeat performance because this time you are part of the ensemble. What if something happens to you or another cast member? Brock: I have a very small role in this show, sharing with another performer. There is always the chance that illness, injury, or personal issues will happen. It’s winter, performers get sick, snow and ice eat into rehearsal time, injury—things happen. If we have to make adjustments, if I have to jump in, that’s what we do. That’s part of making it happen. In ten years, this has only happened twice for the IRC. That’s a consistent track record of delivering. You do what you have to do, yes? Live theater is a demanding form, and I’m difficult to work for so that can be a tricky combination. However, since we have an ensemble of performers, we can be flexible in calling on people who have worked with us consistently—they know the form and can jump into the circus with no preparation. I think our audience appreciates the attitude that we will go to the ends to get the show up and going. They look forward to our productions and expect we will employ creative solutions to the many challenges we face in the course of a production. Ten years has produced a lot of performers who rotate in and out, depending on home and work responsibilities. I hope many will be performing with us for many years. Eger: In your search for the best surreal plays, what themes resonated for you that you will introduce later this year and next year? Brock: In 2016, heading back to serenity for Ionesco’s The Chairs, a beauty on many levels (Fringe 2016); Ives’ Lives of the Saints (November 2016); Ludlum’s The Artificial Jungle (date TBD); Albee’s The America Dream (date TBD); Stoppard’s Jumpers (date TBD); and Beckett’s Shorts and Endgame (date TBD). Brock: I am interested in exploring what we do with silence: how it terrifies, informs, soothes, and provides a safe haven from this absurd world we inhabit. And, thank you and Phindie for all you do to illuminate the process of our productions. Eger: Thank you, Tina, and curtain up for THE GOVERNMENT INSPECTOR—a world classic and another surreal IRC gem. 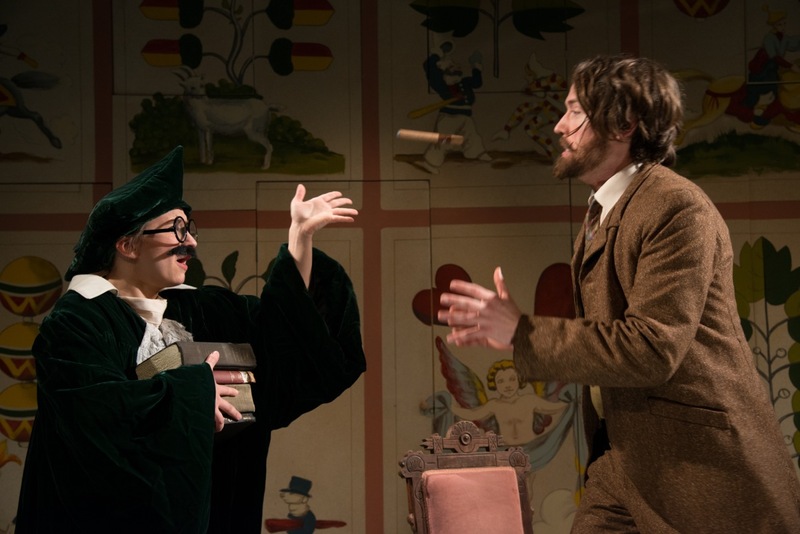 Idiopathic Ridiculopathy Consortium’s production of THE GOVERNMENT INSPECTORby Nikolai Gogol, directed by Tina Brock runs through February 28, 2015, at Walnut Street Theater Studio 5, 825 Walnut Street, Philadelphia. 215.285.0472 or idiopathicridiculopathyconsortium.org.